Hello friends! How I have missed you. If you missed the memo about my radio silence you can catch up here. My kitchen model is *almost* done. Really all that is left is putting up our tile for the backsplash and getting our new dining table and chairs –which should be arriving this week. I have been so tempted to share photos of the remodel with you but I really want you to see the completed project and for that you will have to wait until after next weekend. As my regular readers may know I am now 40+ weeks pregnant. Baby still hasn’t arrived yet. My children like to take their time and then be kicked out. So in order to keep busy and pass the time I decided I would can some yummy jam. Do you have a surplus of strawberries on hand? Let’s turn that surplus into something you can enjoy all year long or gift to lucky friends and family. We be jammin’ (sorry this is always in my head when I can jam). These little jam jars are sealed by boiling them in my large canner. If this is your first time canning this recipe is totally doable if you have the proper supplies. The list of supplies below is what I use when canning. Canning jars and rings need to be sanitized before you fill them. You can put them in boiling water or run them through the dishwasher and leave them in the hot dry cycle until ready to use (this is what I did). Once you are getting closer to putting the jam in the jars place the jar lids in a pan of simmering water for about five minutes. I don’t mind the strawberry seeds in my jam but if you are opposed to seeds you could run your fruit through a food mill. It is really important that all supplies are ready to go when you begin this recipe. Read through the steps several times before you begin. Clean and hull about four pounds of strawberries. Crush the strawberries with a potato masher or pulse in the food processor or blender. Sprinkle on ONE cup sugar and let rest for one hour. Fill your large canner with water, set on stove, and cover with lid. Bring pot to boil on high heat until ready to use. Place a metal spoon in a glass of ice water. Set aside. Set a large pot on the stove. Stir in strawberries, sugar, pectin, and vanilla beans over medium high heat. Stir often to prevent fruit from burning. Skim off any foam that comes to the top. Bring fruit to a full boil (this took about 10 minutes). Boil fruit for one minute. Test the jell or thickness of the jam by spooning out some of the jam with your ice cold spoon and allowing to come to room temperature. If the jam is "set" to your liking you can proceed to canning. However if the jam is still too runny add another tablespoon or so of pectin and return to boil for one minute before testing again. Remove vanilla bean pods. 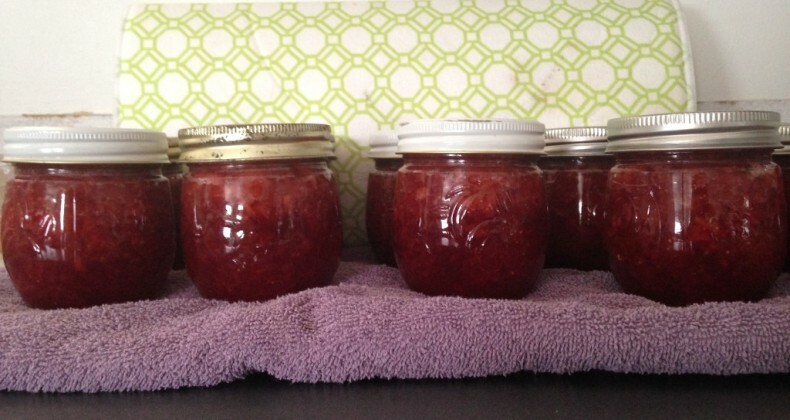 Ladle the jam into your hot and sanitized jars, using a canning funnel can help keep your jars cleaner. Leave 1/4 inch head room. Wipe off any spilled jam before placing on the lid. Seal the jar with a canning ring until just tightened. Place the filled jars in your canner and lower in to the boiling water. Process for 5-10 minutes. The higher your altitude the longer it will take to process. Carefully remove the jars with your jar lifter tongs and let them cool in a draft-free area without touching or bumping them for 24 hours. (I usually set them on a bath towel in an out of the way corner of my counter). You might be able to hear the pinging noise of the lids being sucked down and sealed. *music to my ears* If you press down on the cooled lid and it gives that means it didn't seal properly. All jars that are properly sealed can have the rings removed or loosened. Any jars that didn't seal properly can be placed in the fridge and used right away. A general rule is your jam should last about 6-12 months... I always run out after a few months. Thank goodness the kitchen remodel is finishing up before the arrival of the baby! 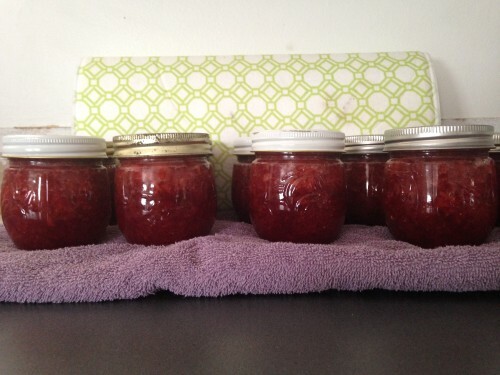 This is going to be the summer I learn how to make jam. This recipe will come in handy! Making jam has become my new obsession. I have a long list on jam flavors I want to try next. Good luck to you on your jammin’ adventure! Thanks Pamela! I am certain your rooftop strawberries would make the best jam.